Simon & Schuster Books for Young Readers, 9781442446915, 304pp. "Critics are raving about Nate." "The book I needed--and would have adored--when I was a kid. Federle writes from the heart and hits you in the gut--not to mention your funny bone." "A smash hit! If there were a Tony Award for books, it would go to Better Nate Than Ever." "I can’t stop reading this book! Nate Foster’s hilarious and touching adventures en route to making it big on Broadway just kill me—I’m falling in love with New York City all over again, and with Nate for the first time. Please, Tim Federle, take a break before writing your next book, so I'll have time to write mine. I can only hope it's half as much fun as Better Nate Than Ever!" "Hilarious and heartwarming...this book soars." 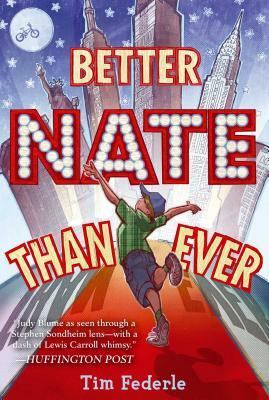 "From his obsession with the first franchise restaurant he sees in New York to his infectious enthusiasm for city-life, Nate is the quintessential starry-eyed small-town boy in the Big Apple...Between the hijinks and the humor, however, Nate reveals himself to be a kid who accepts that he is a disappointment to his conventional family and yet still remains solidly himself, optimistically certain that there is a place for guys like him somewhere in the world. There’s plenty of substance to go along with the razzle-dazzle here, so sit back and enjoy the show." "A story of Broadway dreams tailor-made for the younger side of the Glee audience...Nate is a quirky and endearing leading man from the start, and anyone who has ever felt out of place will easily identify with him. It’s a joy to watch him fall head over heels for a city that couldn’t care less about him—in the best possible way...Federle’s debut addresses—deftly—big and solemn issues in the second half of the novel, particularly with regard to family, sexuality and religion. Bravo, Nate!" "Funny and insightful...This talented first-time author has made the classic Chorus Line theme modern and bright for the Glee generation." "Explores weighty issues such as sibling rivalry, bullying, religious parents, and gay or questioning teens with a remarkably lighthearted and humorous touch totally appropriate for young audiences."